While my focus was on the learning system of Moodle the last couple of days, there are also free and open source projects for other CMS's (Content Management System). Like the Osmobi initiative developed by Siruna (University of Ghent, Belgium spin-off). Now let's say you are a learning manager in your organization or institute, and you have a Joomla and Drupal CMS. Your learners/students ask you (after buying an amazing array of different mobile devices) if they can access the learning content through their mobile phones (yes, that is how these things happen, we all know it - that is how it happened in my institute as well). Than what do you do? Do you say 'no, to difficult', or do you take a chance with some easy to adapt (only tech stuff is choosing 'themes' and some minimal settings), fully ready package that enables access for a mind-blowing set of mobile devices? Well, of course you go for the second option! If you are using a CMS or LMS for your educational organization or your company, it will definitely save you time and money to incorporate the Osmobi into your system and try it out. The developers have included a step-by-step tutorial, that makes it really simple to alter the application for your own needs. 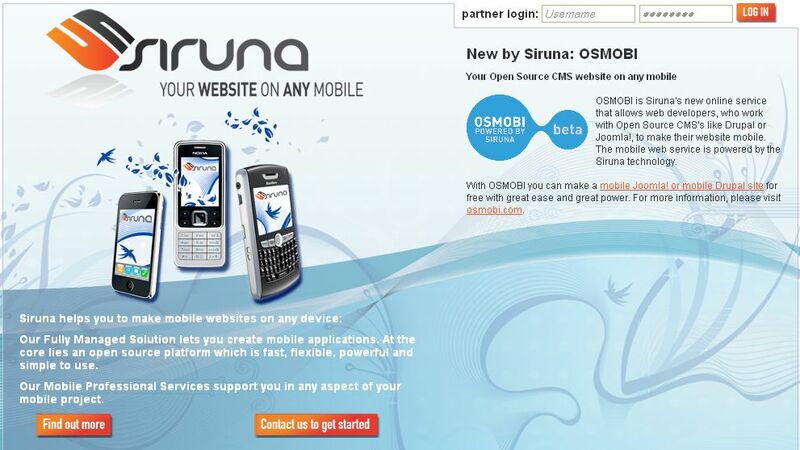 Today I got a message from Frank Gielen, he is the CEO of Siruna (which developed Osmobi) a mobile application that turns your Drupal or Joomla CMS into a mobile platform. And it is for free! (thanks to the Belgian Government and some commercial partners). The added advantage of this mobile application, is that it incorporates an intelligent layer that recognizes your mobile device and as such redesigns the layout to fit its mobile needs (size of screen, operating system...). So ANY mobile will be recognized! AND what is even more wonderful: in case your mobile device is recognized, but not yet supported by the system, the system itself will go and look for the necessary data on the web to enable optimized access for that mobile device. Afterward this new information is added to the central information of the application. Here is the link to the tutorial, and for those who want to see an overview of the application, look below. Many of you have asked the iPhone/Moodle team to break open the code and enable access for Android smarthphones as well. Well, our formidable and wonderfully skilled developer Beto Castillo Llaque has done ground breaking work (again). If there are any headhunters, pick-up Beto's name (who works at the Institute of Tropical Medicine Alexander von Humboldt), he is truly an amazing PHP developer and... astonishingly quick and creative! For those of you who have an android phone, try-out the demo-site we created initially for the iPhone, we have added additional coding to give access to android phones, so try it out, but remember these are just the first preliminary steps in the recoding... so do not expect everything to work for the Android phones yet. Beto has made a youTube movie on the possibilities with the Android. Now the movie is not yet edited, but you really get an idea of what it looks like. For this movie he used the android simulator. And if you look closely you can see his picture. Some of our volunteer testers of the iPhone/iPod/Moodle web-application have indicated that they struggled a bit with having to login again each time they went out of the application. The team has enabled easy access by offering a 'home button' that can be put on your iPhone/iPod screen and with which you can simply login with one click. With all the commotion with opening up Moodle to iPhone (and now some android driven phones, but still in the initial try-out phase), I was not keeping up with my blog lay-out. But now, I finaly got the retweet button for blogger embedded in my blog html template, as well as a facebook button. In order to do this, I relied on the blogger plugins blog: here is the link for the retweet button and this one for the facebook button. But to make things easy, I wrote down what I chose. 1.Select the retweet button styles,and copy the corresponding code into a text file. And after that I followed the steps for the retweet code (except you do not need to put in your facebook account, you simply copy it in your blogger template). Today we have opened the demo site of the iPhone Moodle site I talked about in previous posts. Feel free to have a look at http://iphone.moodle.com.au/ and share your remarks on one of the fora. The only thing you need to do to get access to the fora is to register (for free). Thank you for your willingness to have a look and exchange your ideas with us. Once we go through all remarks, and we incorporate them in the existing code, the code will be released. Just a quick narrative of how the project came about. This project came about by accident. It was never our attention to develop a Moodle/iPhone/iPod solution from the start. Actually, we were just happy working on a continued medical education for HCWs that previously did not have access to updated learning material. But as we got feedback from the HCWs in the field, we saw the need to adapt Moodle to enable complete access for the iPhone. The iPhone did work with the MLE, but it did not allow access to all the interactive features of Moodle. So we only took action as it had a clear purpose that could benefit our learner target group. The coding got developed by looking at what was already there, and thinking about what would be relevant to have. Whenever we were confronted with a problem, it was posted on one of the mobile Moodle forums, so everyone could think collaboratively. An open community that can give support while developing any type of application is a strong benefit for any endeavor. First stage: we looked around for recoding that had been done all around the world. We found two main developers that really made a difference: Hiroki Inoue from Learning Design located in Japan and Dale Mugford from BraveNewCode located in Canada. They had been doing ground breaking work for iPhone access to other php-programs. Second stage: the researchers and developers of both institutes (ITM and ITMAvH) started adapting the code. The first steps of the coding were discussed in the community forums of Moodle (http://moodle.org/mod/forum/discuss.php?d=104599). All along people tested the web application. Third stage: an international team of Moodle and/or iPhone experts joined the final stages of the coding process to ensure we could offer a demo site that was functioning well. The international team made sure the code was understandable to all, by adding extra information were needed. A dedicated site was set-up: http://iphone.moodle.com.au/ (thanks to Julian Ridden for setting it up, previously we were working on a much slower server of our own). Fourth stage: the demo stage: on the central iphone/moodle website a demo site is opened from 19 March 2010, today. This enables everyone to come to the demo site and try the web application via their own devices. Fifth stage: the open source code will be released under a Creative Commons General Public license. Free for all to download, adapt and share. Through the Unesco Education portal I came across a very worthwhile and relevant publication for those interested in teacher motivation in the African region. Although this has no immediate link to eLearning, eLearning has been put forward as a possible solution (mainly in very remote areas with lack of teachers) to get people trained to become teachers. Primary education in Africa meets many challenges, but the biggest challenge is the teacher challenge. At the midway point for achieving the Dakar goal of universal primary education (UPE), teacher matters are a burning issue in Africa, as witnessed by the place taken up by this topic today in international conferences devoted to Education For All (EFA), an initiative that put forward the rapidly nearing deadline of 2015. Teacher matters are clearly at the heart of all considerations on the expansion of education systems, whether pedagogical considerations as to the quality of learning, social concerns related to the more or less equitable character of education provided in terms of quality and quantity, or questions raised as to the financial sustainability of the efforts still to be accomplished in terms of recruitment simply to reach UPE. The UNESCO Office Dakar and Regional Bureau for Education in Africa; Pôle de Dakar have published a study related to this topic (196 p). The purpose of this study is to help setting up teacher policies that address Africa’s educational challenges. Which teachers for what kind of training? The report is well documented and it highlights some of the main challenges still in need to be tackled. The dialogue necessary for the successful transformation of policies decided on as a matter of urgency into long-term sustainable policies ensuring the provision of motivated and trained teachers, must be initiated at country level. The different elements of teacher policy seem poorly documented. Aside from the scarcity of evaluations concerning aspects likely to affect the pedagogical effectiveness of teachers, teacher populations themselves are not well documented whether in terms of composition or progression. The administrative and pedagogical management of teachers deserves special attention. The improvement, or the implementation, of proper pedagogical management of teachers should also be high on the list of priorities in these new teacher policies. Last week I met Bert De Coutere during a preliminary meeting on a platform site for eLearning in Belgium. Bert is a great learning person to know. He is involved in learning management at IBM and as such he has given so many presentations, lessons, workshops… that I think he is one of the sole people you can just ask to stand up and share knowledge on any learning strategy. His motto is: learn, do, share! And … he is Competent! But how can we tell anyone is actually competent? How do you know you are competent and can we measure it? Well, Bert came up with a wonderful book on the topic. 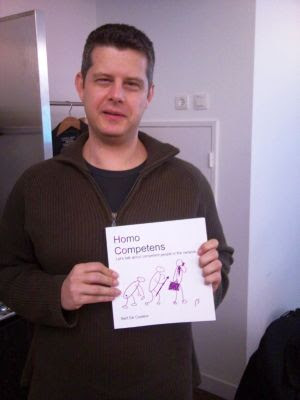 The book is called Homo Competens: let's talk about competent people in the network age; or HoCo for short. The book has a lot of links and references and it is updated regularly (contemporary eBook). If you are into human resources, change management, or management as such, you might want to buy this book. In just as little as 196 pages Bert opens up a framework for measuring competency. Now, this is the first book of Bert on the subject and as such he covers all the basics. The book also features some introspective questions, which lead you to think about yourself in a more Socratic way. Is what you think you are really true? And clear for others? You build and maintain competencies by doing three kinds of activities: you learn, you do and you share. You do these all at once, but the biggest category of activity will determine your level as apprentice, practitioner or master. Competencies have only indirect value. The real value is in what you DO, not in what you are ABLE to do. The ownership of your competence is shared amongst yourself, your employer and your government. In this day and age, you have the biggest claims on your competence. Therefore you re the prime responsible for selecting them and investing in them. When you are craving for recognition, share! The book makes you think. As I was reading, I mostly agreed, but sometimes disagreed with what Bert wrote, and that – to me – makes up a good professional book, as I feel that I am thinking, I know I am learning (adding to my competency). If you want to look around first, check out the Google books or just simply jump on it and buy it from Lulu (the eBook is only 10 USD!). Bert, I am already looking forward to the follow up book! If you want to stay on top of Bert's activities, you can follow his blog. 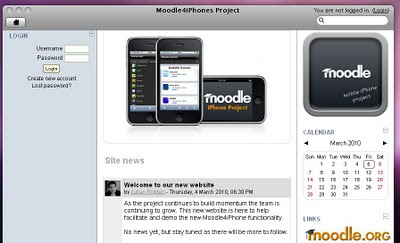 The iPhone/Moodle team has been actively adapting and testing the iPhone/Moodle code. So we invite you all to join us next Friday, i.e. Friday 19th March 2010 for testing out the code that we have been building. Thanks again to all the members of our team, it is an honor to work with you all. Our now expanded, International project team (in alphabetical order): Lewis Carr, Beto Castillo Llaque, myself (Ignatia/Inge de Waard), Luis Fucay, Hiroki Inoue, Carlos Kiyan, Julian Ridden, and Maria Zolfo. Feel free to join us next Friday. In order to join the demo and try the web-application starting from Friday 19th March 2010, we ask you to register in the iPhone/Moodle site here. On Friday you will all get full access to the demo course and you will be able to try it out as you like. After the demo fase, and after we have gone through your remarks, the code will be given for free under a Creative Commons General Public license so we can all use it, adapt it to any needs, and redistribute it for all. We have been translating the demo movie in a couple of languages that you can see on our official youTube channel, in the hope that we might connect to many of you. We also like to thank the great musician David Arkenstone for allowing us to use an excerpt of his music for the demo movie! So join us on Friday 19th March 2010! We would love to hear your feedback and improve the coding so that we can have quite a good first release of the open source code. Things moving on several fronts: getting proposals out, checking codes, making coding manuals (thank you very much Beto!). 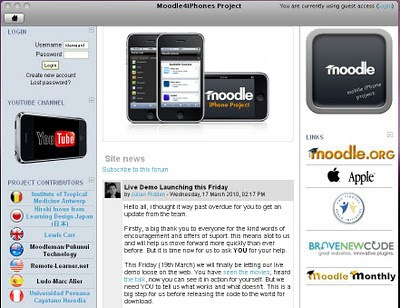 iPhone on Moodle update: a growing team, but where is Apple? The iPhone on Moodle project I mentioned last week is speeding up and when listening to the Moodle/iPhone buzz, the momentum is growing. So it's time for an update to introduce the new (old :-) kids on the block. As we are running up to the release of the code, we are waiting to hear all the feedback of the above mentioned guru's. For they bring the extra confidence we need to publish what is developed. For those of you interested in some screenshots of the iPhone/Moodle application, please have a look here. Now inventions are never done out of the blue. If you want to see the history evolving from just a couple of ideas and ending up with more developed results look at the Moodle forum here (you can login as a guest or register) and discuss or add to everything that is said there. Some of the long Moodle members have been pointing us in the right direction, so we are also VERY grateful for all their support. Some of you have been asking if we contacted Apple. Well, we did, but no reply from that front yet. So here I launch a warm appeal to all the Apple people (read: if you know someone that works for Apple, please give them a nudge). Dear Apple/iPhone people, we would like your support as well. Please do not misunderstand our humble team, we do not want anything for ourselves. We would however surely be happy if we could get the same mobile learning project out somewhere else in a low resource setting. For we have depleted the Tibotec REACH grant that we won for 2009 (it was funding for one year). So we would surely love to help start up a similar health project or why not a train-the-trainer project through mobile learning in other low resource settings. Such a project does not demand a lot of investment, the application we brought together also works on iPod touch. And to all of you: if you know of a developing region that would benefit from a similar project, let us know, or let Apple know! Maybe if we all ask very politely, they will allow a similar project to come to live using the open source code for iPhone and Moodle. Over the years I have met both Niall Winters and Yishay Mor on many occasions. They are both strong believers in empowering people. They just finished the first of a series of workshops on the topic of mobile learning and... if you can join them in the upcoming workshops, do it (I will if I can), you are bound to learn a lot! What is it all about? Niall and Yishay recently started a new idea on the site Mobile Learning for Development (ml4d) in which they search for the narratives behind mobile projects aiming at building a knowledge bank that can serve qualitative research on mobile projects later on. Now they only started to upload mobile projects, but the aspect of narrating what has happened and which impact it has is such a fine resource of information, that it is already a worthwhile read. If you have great mobile projects and you are willing to share your input send them a message. "The ML4D initiative aims to engender a design-level discussion among practitioners in the field, in order to inform them of the challenges and potential solutions, and to facilitate rapid spread of critical design knowledge. Our main channel of activity is a series of workshops, supported by open on-line resources. These workshops will provide participants with the capacity to design their own solutions using mobile and social technologies. This will build on techniques we have developed over the past three years and on the course module 'Designing mobile learning activities', run by Dr Niall Winters at the LKL. These workshops are targeted at education, social action and development practitioners across the academic, commerical and NGO sectors. The typicial participants will be involved in the practical work of designing and developing a mobile application to support learning and/or training. 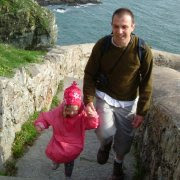 The workshops have been designed for those at the beginner and intermediate levels."